Bulk Stickers is rated 4.8 out of 5 by 16. Print a large quantity at a great price. Rated 5 out of 5 by RiverStone Church from Great quality! Happily surprised for the price Didn't know what quality would be like, but the graphics turned out really nice. The material was a little heavier than expected! Not super thin! Rated 5 out of 5 by The Devil from Just right Perfect for my use.Helpful staff made sure it was right! I will use these as motivational items for our charity bike ride for breast cancer survivors. The girls will love them! Rated 5 out of 5 by Neil from Excellent in all areas Box labels came out perfect. Great price, Great quality, quick turnaround. 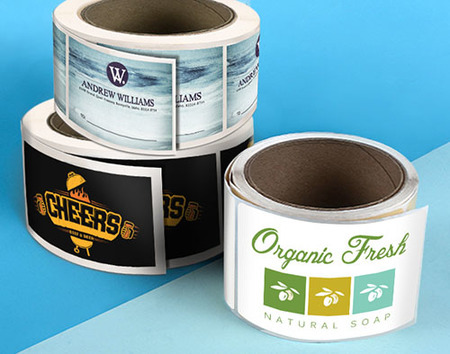 Whether you need personalized stickers for promotions or labelling, our bulk sticker printing options give you an incredible array of uncompromised high-quality choices at economical price points. The variety of options make it possible to create stickers for any need at reasonable rates. Print your own custom bulk stickers by choosing your paper, coating, and shape, then add your own design, to create custom wholesale stickers that you don't have to compromise on quality. Give our print experts a call for answers about your bulk sticker order. Use our Bulk Sticker layout templates to ensure your artwork and designs are sized and formatted correctly. PrintPlace layout templates can be downloaded for each Bulk Sticker size below, in an EPS, PDF, or JPG format for Illustrator or Photoshop. Tips for choosing the right Bulk Sticker shapes. Bulk stickers come in two standard shapes -- square and rectangle. Here’s our recommendations for their specific applications. For labelling and other repetitive needs, these stickers are a good choice. The roll makes for easy storage and faster application, whether by hand or machine. These stickers are a better choice for easy distribution for promotional needs-- no scissors needed. Each sticker will come precut to simply hand them out.